Good afternoon. 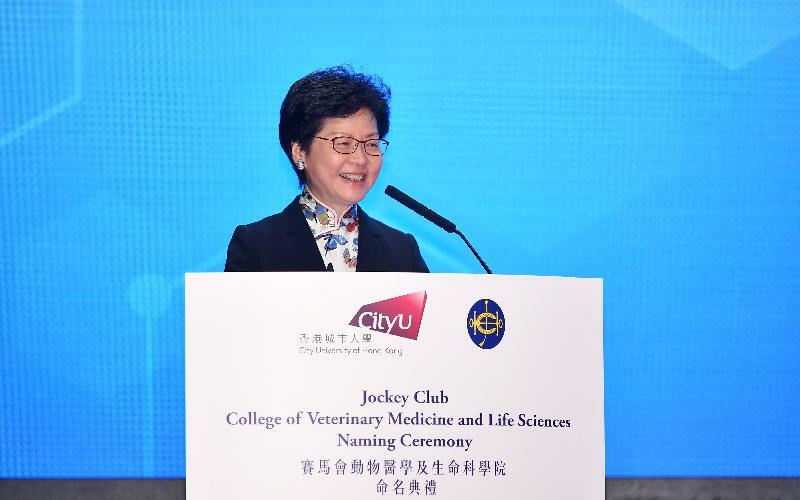 I am delighted to join you for this naming ceremony for the Jockey Club College of Veterinary Medicine and Life Science of the City University of Hong Kong. Today we are celebrating an important milestone in our public health mission as well as our higher education vision, as this College is Hong Kong's first and only veterinary college. To establish a veterinary college is not a simple endeavour. Professor Kuo has described it as a 10-year long marathon by CityU. And it is achieved by innovative thinking and persistence as there were scepticisms expressed in various quarters, including within the Government, during the decade-long journey. We have to thank the CityU team for its perseverance, and the College of Veterinary Medicine at Cornell University for its trust and collaboration. I would also like to express gratitude to the Jockey Club Charities Trust for its generous donation of HK$500 million to CityU. CityU's new initiative in providing veterinary education in Hong Kong is indeed timely. According to the World Health Organization, 60 per cent of existing human infectious diseases are zoonotic, and at least 75 per cent of emerging human infectious diseases originate from animals. Issues such as virus and bacteria mutations, anti-microbial resistance and food-borne disease continue to present new challenges to the medical profession. These challenges are amplified by an increasing risk of disease transmission through cross-border travel and international trade, as well as rising population and density, placing even more pressure on public health. Good public health is the cornerstone of any safe and liveable city. This is particularly important for a dense city like Hong Kong with large numbers of people movement. Therefore safeguarding public health is a top priority for my Government. We fully embrace the internationally advocated concept of "One Health" in planning and implementing our policies and measures to safeguard public health from a holistic perspective involving veterinary and medical professionals. Our respect for the One Health concept and our vigilance in public health have borne fruit. For well over a decade, Hong Kong has remained free from many globally significant and potentially deadly zoonotic diseases, most notably rabies, avian influenza and MERS (Middle East respiratory syndrome). But the recent local incidents of dengue fever have reminded us of the importance of vigilance. As regards the veterinary profession, Hong Kong has all along adopted an open regime, welcoming the best veterinarians trained in overseas universities to come to practice here. Undoubtedly, their contributions have helped to keep deadly zoonotic diseases at bay. But there is no room for complacency. CityU is now blazing a trail with the establishment of the College of Veterinary Medicine and Life Sciences to create a centre of excellence in veterinary and biomedical education. The College has launched Hong Kong's first bachelor programme in veterinary medicine to build a local pool of expertise alongside that of overseas veterinary surgeons. The first cohort of veterinary students embarked on their journey last September. Training highly skilled professionals requires world-class academic and clinical facilities. To this end, CityU will establish a 12-storey One Health Tower as an educational and research base for veterinary medicine and life sciences to complement the College's clinical facilities, livestock farms and veterinary diagnostic laboratory. I am sure that with CityU's commitment to this new initiative, coupled with well-qualified academic staff and excellent teaching facilities, the College will produce graduates who measure up to veterinarians trained in other renowned institutions round the world. CityU's vision and initiative would not have succeeded without the generous support from the Jockey Club Charities Trust. Naming the College as the Jockey Club College of Veterinary Medicine and Life Science is indeed appropriate. Looking ahead, the Jockey Club One Health Tower will not only provide the necessary space for students' learning and research work, but will also serve as a platform for collaboration between veterinary and biomedical science under the One Health paradigm. 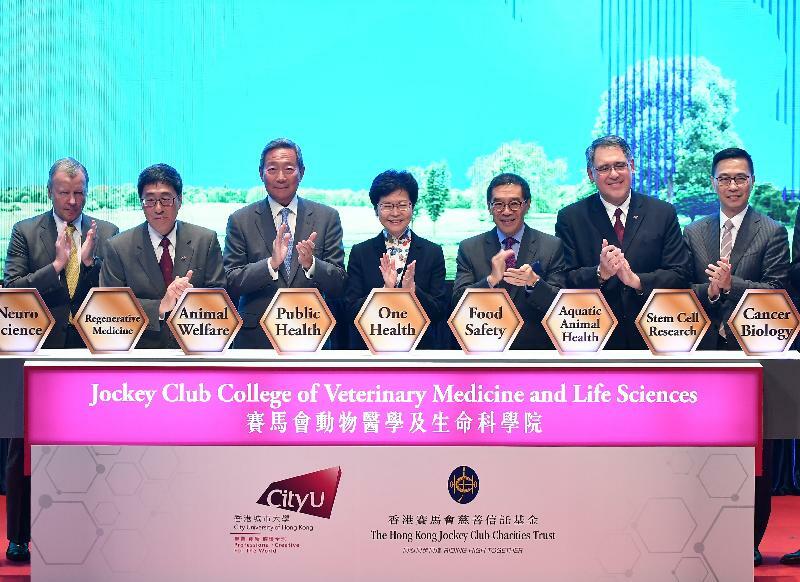 It is also fitting that the Jockey Club will be a beneficiary of CityU's initiative, as the graduates of the College would likely be amongst the targets for recruitment when you enlarge your own pool of veterinary expertise. So this is going to be a win-win result for all. Last but not least, I thank the University Grants Committee (UGC) for its expert advice to the Government and CityU on the proposal to introduce a publicly funded bachelor programme in veterinary medicine in Hong Kong. Carlson has just reminded me that this is only a recommendation to the Government, and as you know the Government does not always endorse the recommendations of the UGC. But on this occasion, I am happy to say that we are willing and happy to endorse the UGC's recommendation. I look to the UGC Chairman that the UGC will continue to work closely with CityU to review the progress of the College. I wish the College, its management, teachers and students a great success and look forward to seeing the first batch of locally trained veterinary surgeons graduate in five years' time.